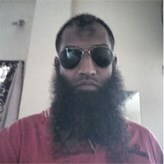 I am Muhammad bin Abdul Hameed, from Hyderabad India,7997081212 WhatsApp,[Visible to Paid Users],[Visible to Paid Users]. Alhumdullilah I fell happy when I see a man with full beard. I am with long beard and wear above ankle. My dad is a retired person,mom is a homemaker,and I am the elder son of my parents,my younger brother's were married one lived separate and another lives in Dubai his mrs lives with my parents,my younger sister is married lives separate. I am in a search of a match of follower of Quran and Sunnah and smart in looking. You are the follower of Quran and Sunnah.